The elbow is a joint that is comprised of three bones. These bones meet in the middle of the arm. Together, the bones function as a hinge that helps to move the arm. Along with the bones of the elbow, there are two major muscles that also help to move the arm: the biceps and the triceps. Elbow pain can be caused from a variety of different circumstances, but there’s good news! Dr. Jason Taylor and staff has vast experience and great success treating elbow conditions. Here is some information that may be helpful in your quest to solve your elbow problem. Elbow pain can be caused by a number of things – certain types of injury such as sports, auto accidents, repetitive stress, and other injuries. 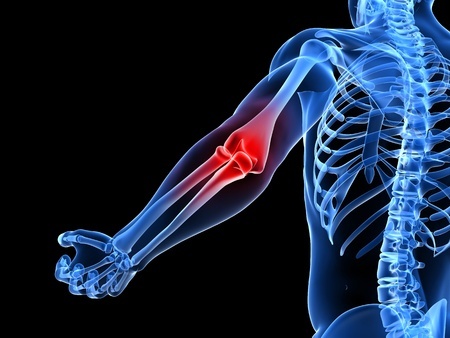 People who perform repetitive tasks such as work functions or sports are at a higher risk of developing elbow pain due to the fact that the bones and muscles within the elbow will be subject to repeated movements.As well, people who suffer from certain other conditions such as arthritis or tendonitis may develop elbow pain as a result of the condition. 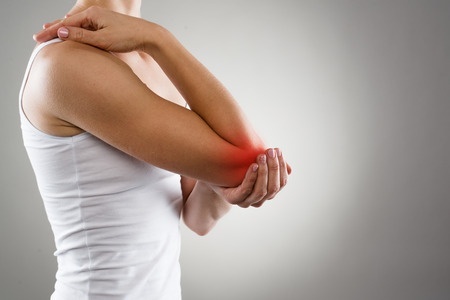 Repetitive stress injuries are a common cause of elbow pain. If your job requires you to use your arms in the same movement over and over again (this could be something as simple as typing, or something as strenuous as chopping wood), the muscles and tendons can experience strain or sprain.As well, if you participate in sports that make regular use of the elbow, such as tennis or golf, strains or sprains can occur. Arthritis can cause inflammation of almost every joint in the body including the elbow joint. The ulnar nerve is the nerve that is commonly referred to as ‘the funny bone’. It travels between the tip of the elbow and the inner elbow bone. If the ulnar nerve becomes pinched, it is referred to as ‘nerve entrapment’. This most commonly occurs after an injury or from repetitive stress. Along with pain, this condition can cause numbness and tingling. When there’s an injury to the hand, wrist, arm, elbow or shoulder, elbow pain can result. Many of the muscles that attach in the shoulder also attach at the elbow and the same can be said for the wrist so you can easily see how many causes of elbow pain can arise. This is why it is so important to be properly evaluated so the root of cause of the problem is addressed to alleviate the pain. The most common symptoms of elbow pain include tenderness and pain in the bony area on the outside of the elbow. This area is where bones and tendons connect. At Spine and Disc Center of Arizona, we use a combination of myofascial release (massage), cold laser, dry needling, joint manipulation, as well as, rehabilitation exercises, to help restore your elbow joint to good working condition, all without the use of dangerous drugs. If you suffer from elbow pain, why not give us a try? We’ll book an appointment for you to come into our office and Dr. Jason Taylor will be happy to evaluate and discuss you options to fix the problem. Performing stretching and range of motion exercises to keep the arm flexible and may assist with elbow pain. Icing the area for twenty minute at a time, 3 – 4 times a day, to reduce pain and swelling. Be careful not to apply ice directly on skin and instead use a towel as frost bite is a concern and can injury tissue. As noted above, non-steroidal anti-inflammatories such as ibuprofen and naproxen can be prescribed at a higher dose the over the counter versions. Cortisone injections can help to ease pain and inflammation and can last for up to three months. Treatments such as Plasma Rich Platelets (PRP) and/or Stem cells can be injected into elbow to provide necessary nutrition to injured tissue to initiate and speed healing. Also, another treatment called Tenex may be an which removes the damaged and degernated tendon tissue through the use of ultrasonic energy which breaks up tissue and is pulled out via hollow needle.